The next hearing will take place on 25 March 2014. Prime Minister Erdoğan has raised an official complaint against LGBT activist and HDP (People’s Democratic Party) Beyoğlu District President Levent Pişkin. The first trial of the court case will take place at the Çağlayan Courthouse on March 13 (Thursday) at 9 AM. Topkapı? Dolmabahçe? The most respected palace for me is the Çağlayan Palace of Justice. I have visited Çağlayan more times than I have the others. And what about that magnificent C Gate with its vast, cold and windy square? There are no words to describe it. But I shall try. Because once again, it looks like we, the impure, are headed for the Palace of Justice. We are an idiosyncratic crowd. I mean, we might not resemble a festive, charmingly bewildered and careless tourist fleet but we have gathered enough visibility to deserve our own description. You will recognize us from our troubled faces. There are bags under our eyes but our eyes are always bright. We owe that brightness and the tension in our souls to the consistency of the state. We usually carry a number of different banners. We scream for whichever soul has been wronged most recently and we make it our own struggle to achieve justice that never seems to manifest in the courts. Now, we have a new object of struggle. 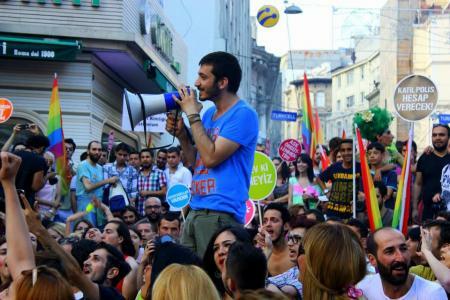 Prime Minister Recep Tayyip Erdoğan raised an official complaint against LGBTI activist and HDP (People’s Democratic Party) Beyoğlu District President Levent Pişkin. The first trial of the court case will take place at the Çağlayan Courthouse 18th Criminal Court of Peace on March 13 (Thursday) at 9 AM. After Prime Minister Erdoğan made a criminal complaint against Levent Pişkin for his “fag” tweet, Pişkin defended himself by making a criminal complaint against the Prime Minister. In his statement, Pişkin stated that the word “fag” is not an insult but a sexual orientation and therefore there was no basis for a crime. Pişkin said, “not only is the word fag not an insult, but even considering the word fag an insult is itself defamation.” The complainant, Recep Tayyip Erdoğan, demanded that an investigation be carried out based on Article 125/1 of the Turkish Penal Code for insulting someone about his personality. LGBTIs got their share of Prime Minister Recep Tayyip Erdoğan’s aggressive style against women, various opposition groups, and minority groups. Following the Prime Minister’s tweet of “I am a perfect Alevi,” LGBTI activist Levent Pişkin tweeted, “Waiting for the PM to declare, ‘I am a perfect fag. Obviously I will not learn how to be a fag from you.’” The Prime Minister filed a criminal complaint against Pişkin following that tweet, revealing once more the policy of exclusion and disregard towards LGBTI in the 11-year long Justice and Development Party (AKP) government. As someone who has participated in fag politics and has been a self-identified fag for years, I am filing a formal criminal complaint against the Prime Minister, we will not leave faggotry to them! We claim both faggotry and its honor and shame.